2868 Chandelle Ln, Overgaard, AZ 85933, 4.12 acres, $335,000. One of a kind 4.12-acre lot at the prestigious, aviation-oriented Mogollon Airpark (AZ82) will accommodate a very large hangar and home. Conveniently located at the NW corner of runway 21, it affords over 276′ of taxiway access. 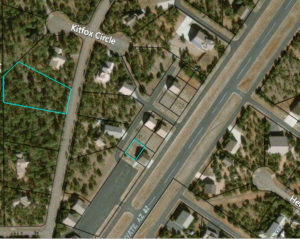 This scenic high desert heavily treed lot has a mix of juniper, pinion and tall pines. The easy to build terrain varies from level, rolling to gently sloping. Utilities including electric, water and phone/DSL are available on the property. Local builder recommendations available. HWY 260 to Overgaard; North on Airpark Drive; right on Constellation Lane; right on Chandelle Lane; sign on property on the right. More information about this property is available on Zillow by clicking HERE, or contact Mike Christensen, West USA Realty, (602) 740-5403. 2286 Earhart Circle, Overgaard, AZ 85933, 0.47 acres, $79,000. This heavily treed 0.47 acre corner VIEW lot has direct taxiway access. Utilities including electric, water and phone/DSL are available on the property. Need more room to build your dream home? 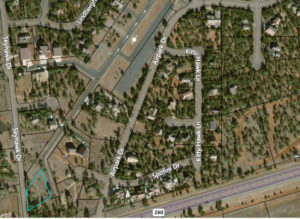 Adjacent parcel 206-29-111 with 50′ x 42′ hangar and ¾ bath is available. Combine both properties to provide a 0.89 acre private home/hangar lot. Local builder recommendations available. HWY 260 to Overgaard; North on Skyhawk Drive; right on Constellation Lane; Sign on property on the left. 2753 Kittyhawk Ln, Overgaard, AZ 85933, 0.28 acres, $23,900. Affordable, level, beautiful treed 0.28-acre lot. Along with fly-in privileges this lot is just a short walk from all of the amenities; aircraft tie downs, club house, tennis/pickleball and basketball courts. Need a place to store your aircraft? Hangar lots with taxiway access are available. Utilities including electric, water and phone/DSL are located on the property. Local builder recommendations are available with plans to build your home and hangar. HWY 260 to Overgaard; North on Airpark Drive; right on Kittyhawk Lane; sign on property. 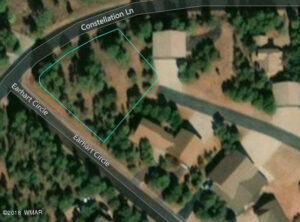 2794 Constellation Ln, Overgaard, AZ 85933,1.26 acres, $114,800. 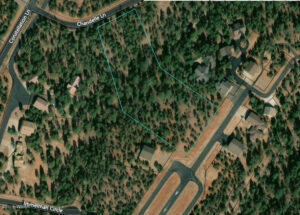 Beautifully Ponderosa treed 1.15 acre lot. 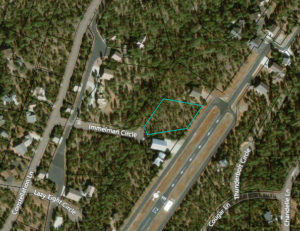 This secluded location is on the west side of the Mogollon Airpark (AZ82) and includes landing rights. A 4 bedroom septic, electric, water and telephone/DSL are located on the property. This sale also includes a nearby 0.11 acre hangar lot Track JJ (Parcel 206-29-540) with mid-field taxiway access. Local builder recommendations are available with plans to build your dream home and hangar. Directions: Hwy 260 to Overgaard; North on Skyhawk, right on Constellation to sign on property (L) – just past Aero Mech Drive. 2356 Immelman Cir, Overgaard, AZ 85933, 1.23 acres, $110,000. PREMIUM 1.23 acre lot has 179′ of parallel taxiway access and includes fly-in privileges. The level terrain makes building easy! Utilities including electric, water and telephone/DSL are available on the property. Local builder recommendations are available with plans to build your dream home and hangar. Directions: Highway 260 to Overgaard, north on Skyhawk Drive, right on Constellation Lane, right on Immelman Circle; sign on left at end of cul-de-sac. 2746 Air Park Dr, Overgaard, AZ 85933, 1.05 acres, $107,500. Level 1.05 acre lot with direct taxiway access on the south end of the runway and includes fly-in privileges to the Mogollon Airpark (AZ82). Utilities including septic, electric, water and telephone/DSL are available on the property. Local builder recommendations are available with plans to build your dream home and hangar. 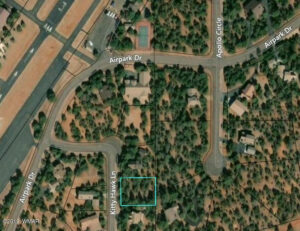 2741 Skyhawk Dr, Overgaard, AZ 85933, 0.61 acres, $64,900. 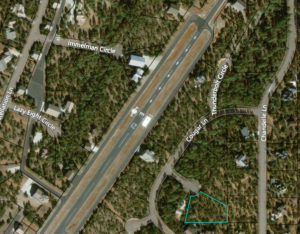 This 0.61 acre home lot is the lowest priced property on the Mogollon Airpark with taxiway access and includes landing rights. Utilities including electric, water and telephone/DSL are available on the property. Local builder recommendations available with plans to build your dream home and hangar. Directions: HWY 260 to Overgaard, north on Skyhawk Drive, sign on lot on the right. 2353 Immelman Cir, Overgaard, AZ 85933, 1.45 acres, $199,000. 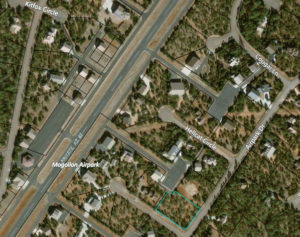 Parallel taxiway access to this 1.45 acre lot located on the west side of the Mogollon Airpark (AZ82) runway. 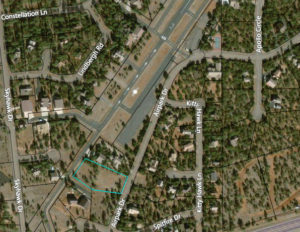 This heavily treed lot features 243 feet of TAXIWAY FRONTAGE and includes landing rights. Utilities including electric, water and telephone/DSL are available on the property. Local builder recommendations are available with plans to build your dream home and hangar. Directions: HWY 260 to Overgaard, north on Skyhawk Drive, right on Constellation Lane, right on Immelman Circle, sign on property. 2346 Voyager Cir, Overgaard, AZ 85933, 0.89 acres, $99,000. Corner 0.89-acre lot backs up to hammerhead H3 for direct taxiway access and includes landing rights. Ideally located near midfield for convenient taxi. The level topography will minimize building preparation and cost. Utilities including electric, water and telephone/DSL are available. The septic system is installed. Local builder recommendations are available with plans to build your dream home and hangar. Directions: Highway 260 to Overgaard, turn north onto Airpark Dr to Voyager Circle. Property is on the NE Corner. 2795 Constellation Ln, Overgaard, AZ 85933, 0.77 acres, $89,000. Perfect CENTER FIELD location on the west side of the Mogollon Airpark (AZ82) runway. 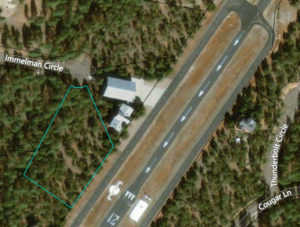 This level 0.77 acre lot has 189′ of taxiway access and includes landing rights. Utilities including electric, water and telephone/DSL are available on the property. Local builder recommendations available with plans to build your dream home and hangar. Directions: HWY 260 to Overgaard, north on Skyhawk Drive, right on Constellation Lane, sign on property. 2373 Wildcat Cir, Overgaard, AZ 85933, 0.95 acres, $82,500. 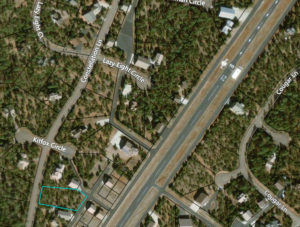 Private 0.95 acre cul-de-sac lot on the Mogollon Airpark has level topography minimizing preparation and building cost and includes landing rights. Utilities including electric, water and telephone/DSL are available on the property. The septic system is installed. Have a plane, need a hangar? Hangar/lots are available for purchase. Local builder recommendations available with plans to build your dream home and hangar. Directions: Highway 260 to Overgaard, turn north onto Columbia Ln, turn right onto Airpark Dr, turn left onto Cougar Ln. turn right onto Wildcat Cir. Property is at end of the cul-de-sac.